Test driving a luxury sports SUV. GTS. Those three letters have appeared on many Porsches over the years, from the 904 of the sixties to the eighties’ 924 and the nineties’ 928. Interestingly enough, looking at Porsche’s current lineup, the Cayenne was the first modern model to carry the GTS badge, starting back in 2008. Later followed by the Panamera and then the stalwart 911, the GTS configuration is now available on all of Porsche’s production line up, from the Boxster and the 911, to the subject of this review, the 2016 Cayenne GTS. Announced at the 2002 Paris Motor Show, the Porsche Cayenne is a mid-size luxury sports SUV based on the VW Touareg. While the idea of a luxury sports SUV is commonplace now, the Cayenne was unexpected at launch at the time, and many Porsche enthusiasts felt it signaled the end of their beloved Stuttgart-based sports car company. Yet the Cayenne model proved quite successful, and now accounts for 51 per cent of Porsche vehicles delivered in 2013. While Porsche is still best known for the iconic 911, the Cayenne has become their bread and butter. In Porsche terminology, GTS designates the spec level between an S (like the Cayenne S) and the Turbo or GT model (such as the Cayenne Turbo or Cayman GT4). For the Cayenne GTS, filling the gap between the 420 horsepower S and the 520 horsepower Turbo means a 440 horsepower twin-turbo 3.6-litre V6, which propels its considerable 2,110 kilogram mass to 96 kilometres per hour in as little as 5.1 seconds. This carmine red rocket ship is astoundingly quick and won’t flag if you bring a few friends, or a sizable piece of furniture, along for the ride. Taking a practical vehicle, like an SUV, and molding it into a sports car is a decidedly difficult balancing act. SUVs and sports cars typically exist on different sides of the spectrum as far as performance, ride height, suspension, drive train, cargo space, weight, and handling are concerned. The Cayenne GTS is an impressive blend of these two often antithetical genres, preserving much of the general usefulness of an SUV while upping the sportiness quotient. While the GTS-standard 20-inch black satin RS Spyder wheels may diminish its off-road capacity, the Cayenne GTS is all-wheel drive and all-weather capable (though winter will likely demand a tire swap). 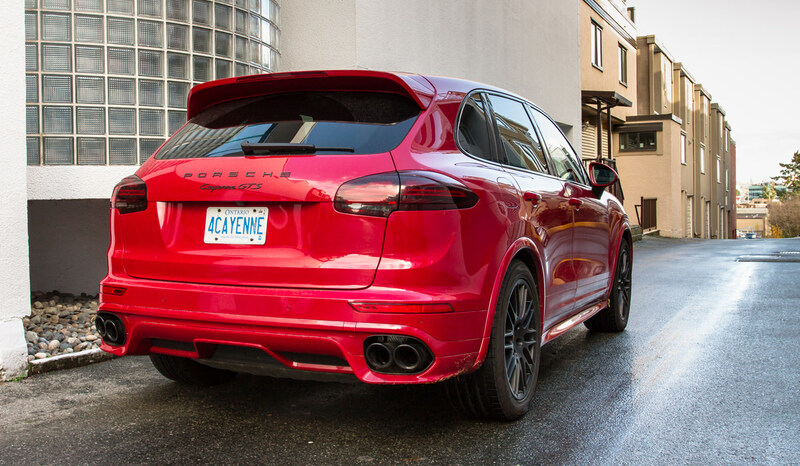 While cruising the chilly streets of Vancouver in December, the Cayenne GTS proved unflappable. 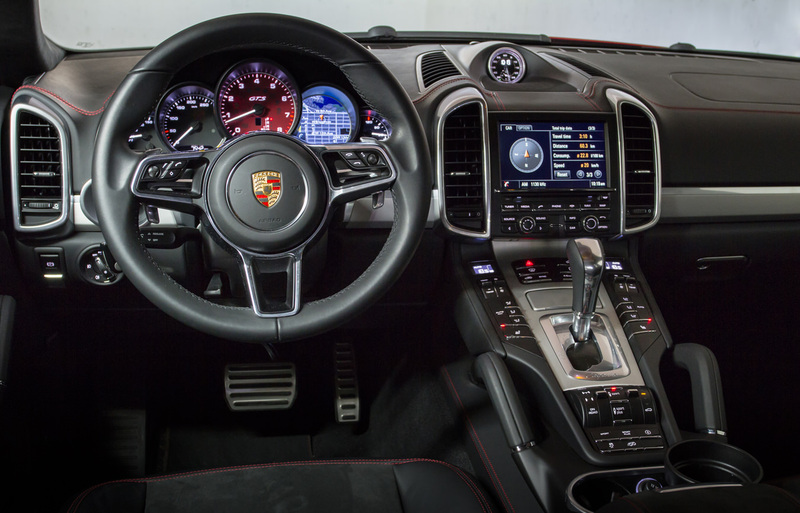 Just as luxurious and tech-laden as you would expect from a modern Porsche, the cabin is a lovely place to enjoy a traffic jam and strategically plan your next chance to dig into the throttle and enjoy the wail of the exhaust, which can be made even louder thanks to a small button on the center console. When you eventually reach the end of your comfort zone (or the speed limit), lifting your foot from the accelerator prompts a series of pops and crackles from the exhaust as the eight-speed Tiptronic S gearbox selects a more subdued gear. For those who prefer to select their own gears, the Cayenne GTS offers both paddle and stalk shifting with impressively fast shifts, especially once the Sport or Sport Plus driving modes are enabled. Sport and Sport Plus modes allow a more aggressive throttle response, snappier shifts, a louder exhaust note, and (with Sport Plus) limited intervention from traction and stability controls. While Sport was my preference, any of the modes offer far more performance than is needed for the street and the Cayenne GTS feels just as it should, like a midsize SUV with a lot of grip and huge amount of power. Its 3.6-litre twin-turbo direct-injected engine is new for 2016 and produces some 442 pound–feet of torque, aided in no small way by the turbochargers. Vicious acceleration is presented with little in the way of lag and the experience, especially mid-corner, is amplified when you realize how easily the Cayenne GTS shrugs off its weight and gets on the move. Of course, plodding around in traffic planning my next throttle-delivered dopamine hit is not exactly the best way to maximize efficiency, so while the Cayenne GTS is rated for a combined fuel consumption of 12.6-litres per 100 kilometres, on this occasion the average was closer to 21 with a mix of city traffic crawling and spirited on-ramp exploration. In comfort mode, the Cayenne GTS is smooth and easy to drive. Visibility is generally good, and it only feels true to size when parking (although Porsche’s Park Assist and Reversing Camera is available for $750 and proves quite handy). Driving the Cayenne GTS, it becomes increasingly clear why Porsche sells so many units. With the general Cayenne experience being accessible, luxurious, stress-free, and smile-inducing, there is a mass appeal at play. 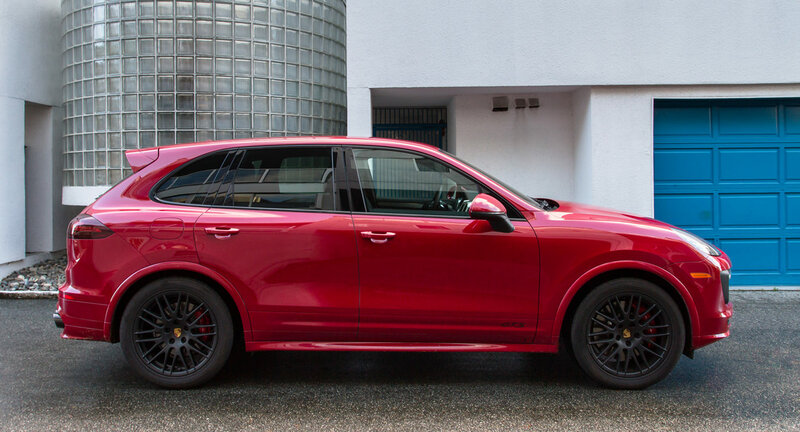 If you need the practicality of an SUV but dream of a 911 and don’t plan for any vigorous off-road adventures, the GTS takes the Cayenne platform in a more driver- and performance-oriented direction. 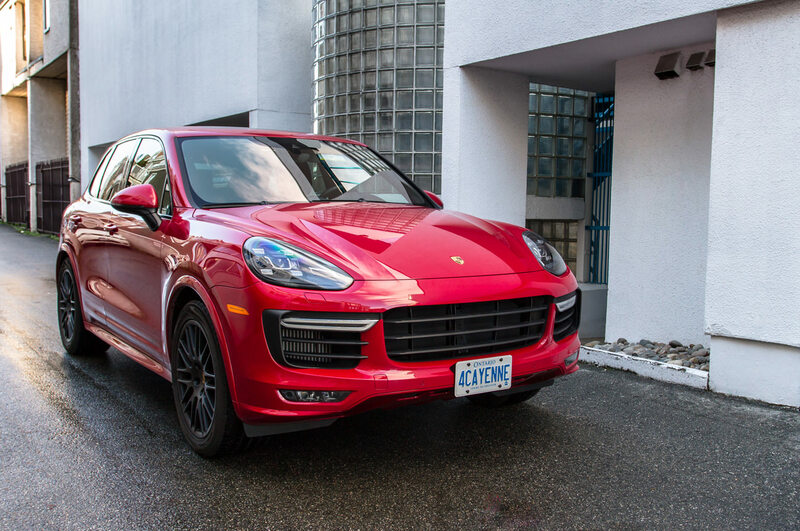 The Cayenne GTS starts at $108,200 with the well-equipped tester reviewed here carrying a price tag of $126,965, replete with options like LED headlights, a sunroof, a BOSE infotainment system, and that carmine red paint job. As real life tends to demand storage space, room for multiple passengers, ground clearance, and general practicality, the Cayenne GTS might just let you have your cake and eat it, too.